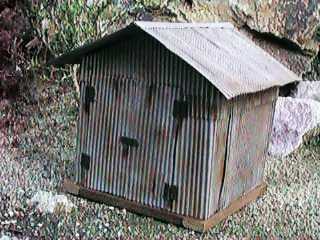 Corrugated metal siding is common in lineside, farm, industrial structures. Siding material can be purchased in sheets of styrene or brass, but the material is somewhat expensive. 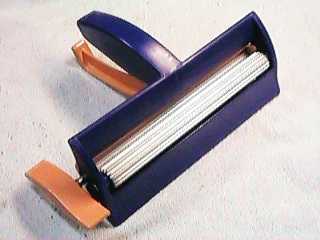 However there is a tool called a "paper crimper" that does an acceptable job of corrugating aluminum cut from soda cans. The corrugations have a 0.12"-0.14" period. At 1:24 scale, this works out to about 3" ripples. This is close enough to the real stuff to be credible. The height of the ripples depends on the material, thickness and hardness of the material that you use. Regular untreated can material crimps to about 0.02" ripples in six passes or so. Annealed aluminum can material crimps to 0.045" in just two passes. Aluminum is an ideal material from which to make siding as its naturally weathered color is very similar to galvanized steel and it will hold up very well out of doors. If attached properly, it will also shed water just like the real thing so that it can protect the interior of a structure. Aluminum also takes paint well so that accelerated weathering is straightforward. The crimper rollers are 6-1/2" wide so that depending on the material that you start with, you can make material that is a prototypical 8 scale feet wide. There is only about 3-1/2" width of clean material available from a soda can and this works out to just under 6 scale feet at 1:20.3 scale or a little over 9 feet at 1:32 scale. 16 oz beer cans should yield enough material to make a scale 8' wide sheet even at 1:20.3 scale. The major tool necessary to make your own siding is a Fiskars Paper Crimper. This tool can be found at Michael's craft stores for about $17. I have also heard that it can be found at WalMart for less. The tool consists of a plastic grip and housing and two aluminum rollers formed with gear like teeth. The material is run back and forth through the rollers until the desired depth of crimping is obtained, limited by the strength of the material being crimped. The tool is designed to make party decorations by crimping paper or light cardboard. However, it is strong enough to crimp thin soft metals. The corrugations are not as deep as with paper, but they are deep enough. Aluminum can material is appealing as it is readily available and cheap. However, if you have a specialty metals supplier nearby, you may be able to find suitable material there as well. Typical aluminum cans are about 2 mils thick and can be crimped as they come, but softer material is easier to work with. Aluminum can material is tempered and work hardened by the can drawing process so that it is much harder than fully annealed or dead soft materials. Aluminum foil is only about 0.2 mils thick. It crimps very well, but it has no strength so that the material cannot even be handled without damaging it. 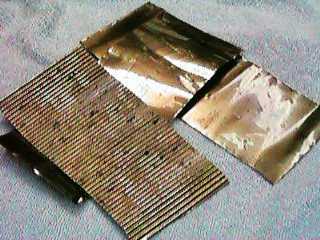 Heavy duty foils are not much thicker and don't work much better. Strips of aluminum can material are obtained by cutting up soda cans. For this you will need a GOOD pair of general purpose metal shears. Cut the can from the opening down to the start of the straight side. Then use the shears to work around the can top and cut off the top. Then cut down the side of the can to near the bottom and work around the can again to cut off the bottom. The strip will be coiled in the approximate shape of the can. At this point I've found it helpful to toss the curled strips into the dishwasher to clean off all remnants of the syrupy mess that was inside the can. The curled strips will get thrown all over the dishwasher, but they'll still get clean and they won't "cup" and hold the wash water. After the strips have been cleaned, straighten them by hand until enough of the curvature has been removed so that they will fit easily into the crimper. Since the material will curl while being crimped, it is not necessary to get it even nearly straight. Trim the piece to the desired width with the shears. If you crimp first and then trim, you will crush some of the crimping at the edges, however another pass through the crimper will repair the damage. Run it though the crimper a couple of times and then turn it over and run it through the other way. You will quickly determine the pressure to apply to remove the natural and crimper induced curvature so that you can come out with a nearly straight piece. The resulting piece is still pretty stiff and may require some massaging to get it to lay flat. 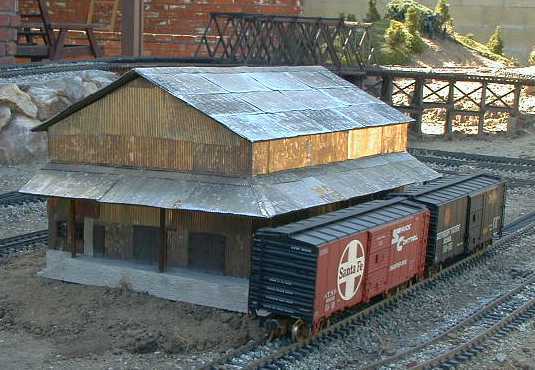 However, old siding is usually bent and deformed anyway so even if it doesn't lay flat, its no real problem. The clean aluminum color of the inside of the can is not too different from galvanized steel. You can use it as is and it will dull slightly in the weather. Rust can be simulated with a little paint. Aluminum cans are coated with some kind of nearly impervious clear coat. Neither paint thinner, lacquer thinner, alcohol, acetone or MEK will dent this stuff. I just leave it on the can. The can material could be worked easier if it were softer. This can be accomplished by annealing the material through heat treating. With a heat soak at a high enough temperature for a long enough time, the can material can be made dead soft. MIL-HDBK-5C provides some data on the time and temperatures required to anneal 6061-T6 aluminum. I don't know if the cans are made from this alloy, but the annealing data should be close anyway. As can be seen from the curves, to fully anneal 6061-T6 takes over 10 hours at 700 degrees F. Since most of us don't have industrial furnaces that will get to 700 F, this gets a little impractical. Few of us could wait the 10,000 hours it takes to fully anneal the material at an achievable 500 F. In fact, the material doesn't have to be fully annealed so we can get away with somewhat lower temperatures and reasonable annealing times. For example, 5 minutes at 400 F will take all the curl out of a sheet of material, but it doesn't soften it enough to make it crimp any easier. I've found that just throwing a batch of material in a self cleaning oven home type oven for the duration of the cleaning cycle goes a long way toward annealing the material. I would guess that the temperature is upwards of 600 F in the self cleaning cycle on my oven. I've also found that the heating inside the oven is not the same at all parts of the oven since strips placed on the top rack discolor more than strips placed on the bottom rack. If the strips have not turned dark brown, then they are probably not annealed enough. Test a strip by bending a corner slightly. If the corner yields and bends, the material is annealed. If the corner springs back, its still too hard. Also, if you crimp material and the material distorts so that the crimps are not parallel down the length of the strip, the material may have been incompletely annealed. One side of the strip is softer than the other so that the corrugations on one side are deeper and shrink the length of the strip more. Another cause of distortion of the material during crimping is that the crimper may be asymmetrical. If the sheets tend to distort in one direction each time, move the sheet sideways an inch or so in the crimper and try it again. You may find that the sheet will either distort worse or crimp straighter. If you can find a spot where the sheets crimp straight, mark the location on the crimper so that you can get straighter sheets more consistently. The upside of annealing the material is that it crimps easier, deeper and quicker. 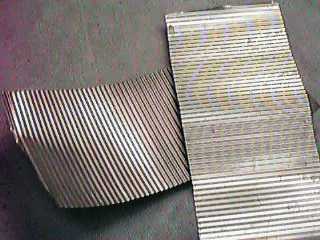 The crimped sheet lays flatter and bends without "oilcanning" like the harder material often does. The downside is that the material discolors and painting is required. Annealed material crimps to between 0.04" and 0.05" thick with about a 0.12" period. The brown discoloration that occurs in an air oven is not a problem at all if you intend to paint the stock. The nonuniform brown undercoat leaves a spotty tone that actually looks like light rust under a light coat of dull gray paint. The brown material appears to be what's left of the clear coating of some kind on the aluminum material. It will flake off in some places during corrugation, but otherwise, it appears to be stuck on there real well. 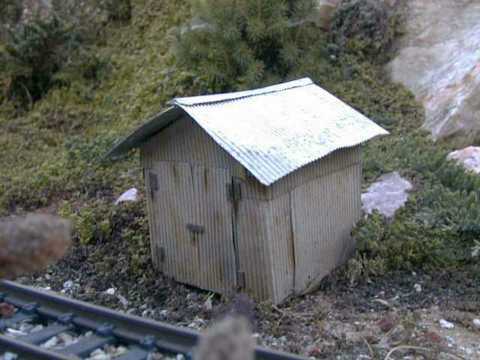 This little 10' x 10' 1:29 scale lineside shack was whipped out in about 2 hours using annealed corrugated aluminum siding. The structure has a core of 1/8" plywood with the siding simply hot glued on. After more than two years in the weather, the little shack is still doing pretty well. Its been bumped and bent a little, and part of the wooden mud sills have come off, but the siding is holding up well. This warehouse is built with a combination of wood, corrugated soda cans and JigStones. The concrete JigStones form a foundation for the building and hold the wood parts above the soil.